Few decisions in the patent law space in the last decade have made as many waves as Alice Corporation Pty. Ltd. V. CLS Bank International, et al., 573 U.S. ___ (2014). Decided on June 19, 2014, the case was a landmark decision that significantly altered the way the courts and the United States Patent and Trademark Office (USPTO) handle software patents. In the days and weeks after the decision was handed down, many claimed that the decision would be the death of software patents and would deal a serious blow to the tech industry at large. While many of these initial claims proved to be hyperbolic, the Alice case has indeed made it much more difficult to obtain a patent on applications with claims that are implemented on a general-purpose computer (i.e., software and business methods patents). At the date of publication, it has been slightly over three years since the case was decided, and enough time has now passed for us to truly understand the full scope of the decision’s effects on the USPTO. In this publication, we will review the Court’s reasoning in the Alice decision, summarize our initial findings from our May 2016 study of the case, explain how lower courts have interpreted the case since its decision, and update our initial findings with new data that examines the case’s effects on applications filed in the post-Alice era. All information herein was assembled using raw data provided by the USPTO and analyzed using Juristat’s proprietary algorithms. Alice concerns software patents, specifically business methods patents, which have been the subject of scholarly debate and judicial confusion for quite some time. Section 101 of the Patent Act defines patentable subject matter as "any new and useful process, machine, manufacture, or composition of matter." This excludes abstract ideas, laws of nature, and natural phenomena. Software is unique in that it sits at the intersection of mathematical algorithms (which are generally considered to be unpatentable abstract ideas) and the process of manipulating a machine to achieve a result, which is generally patentable under § 101. Before Alice, courts generally determined whether a particular software program was patentable using the "machine-or-transformation" test. This test holds that a claim to a process qualifies as patentable if: (1) it is implemented by a particular machine in a non-conventional and non-trivial manner, or (2) transforms an article from one state to another. In Bilski v. Kappos, 561 U.S. 593 (2010), the Court found that this test is not the sole test of patent eligibility, but merely a useful clue, which left little guidance as to how to handle software claims. A computer-readable medium containing program code for performing the method of exchanging obligations (the media claims). CLS Bank used similar technology and, in 2007, sued Alice in district court, seeking a declaratory judgment that Alice’s patents were invalid and unenforceable. Relying on Bilski, the district court held that risk-hedging is a basic business concept and a computer system merely configured to implement it is no more patentable than the abstract idea itself. Further, the court held that allowing a patent on the idea of risk-hedging would essentially preempt the use of escrow systems everywhere and grant a monopoly on an abstract idea. Applying this test, the court found that Alice's claims drew on the abstract idea of reducing settlement risk by making transactions through a third-party intermediary and that the use of a computer to do so added nothing more to that idea, thus rendering the claims patent- ineligible. Alice then sought and received certiorari in the Supreme Court. The case drew significant attention from the software industry, and several interest groups and potentially-affected companies filed amicus curiae briefs to assert their positions, including Google, Amazon, Microsoft, IBM, and Netflix. Upon review of the Federal Circuit’s decision, the Supreme Court first acknowledged that it has long held that claims for abstract ideas are not patentable under § 101. The Court then considered whether computer implementation of otherwise abstract ideas–including claims to systems, machines, processes, and items of manufacture–fell within this same exclusionary rule. It found that the key to applying § 101 to abstract ideas, laws of nature, and natural phenomena is to distinguish the building blocks of human ingenuity from ideas that integrate the building blocks into something significantly more. Thus, the Court concluded, merely introducing generic computer implementation to an abstract idea fails to convert an abstract idea into a patent- eligible invention. If yes, search for an “inventive step”—an element or combination of elements sufficient to ensure that the patent, in practice, amounts to “significantly more” than the ineligible concept itself. Applying the first prong of the test, the Court found that the use of a third-party intermediary to reduce settlement risk constitutes an unpatentable abstract idea because it is a prevalent building block of modern economic practice. Proceeding to the second prong of the test, the Court found that merely implementing this idea on a general-purpose computer did not sufficiently transform the abstract idea into something significantly more because basic computer implementation is not "new and useful" within the meaning of § 101 and adds nothing new to the industry. To illustrate this idea, the Court distinguished Diamond v. Diehr, 450 U.S. 175 (1981), in which the claimed invention used a thermocouple to record temperature measurements inside rubber molds and then fed these measurements into a computer to recalculate the remaining rubber cure time. The Court found that this computer-implemented process was patentable because it improved upon a technological process and did not merely use a computer to implement a common process. Because Alice’s patents did not improve upon the process at issue merely by implementing it on a computer, the Court affirmed the Federal Circuit’s holding invalidating them. Generally linking the use of the judicial exception to a particular technological environment or field of use. While the USPTO has been busy working out the kinks of the decision with its patent examiner corps since 2014, courts have also taken several stabs at interpreting and applying the decision with varying results. Below are a few representative cases that illustrate the various approaches the judiciary has taken when dealing with Alice. Note that this collection is non-exhaustive; rather, it is intended merely as an overview of some of the most illustrative cases that have interpreted the Alice test since it was handed down. Ultramercial sued Hulu, YouTube, and WildTangent, alleging infringement. Hulu and YouTube were dismissed from the case, and WildTangent subsequently moved to dismiss for failure to state a claim under Fed. R. Civ. P. 12(b)(6) on the basis that the patent did not claim patent-eligible subject matter under § 101. Starting with the first prong of the Alice test, the court found that the ordered combination of steps in the patent recite the abstract idea of internet advertising broken down into constituent parts. The addition of novel or non-routine components to the claimed idea did not turn the abstraction into something concrete. Moving to the second prong, the court found that the claims did not assert an inventive step merely because they instructed the practitioner to implement the abstract idea with routine, conventional activity, specified a high level of generality. The fact that some of the steps in the claims were not previously employed in this field is not enough to confer patent eligibility on them, as they are abstract ideas nonetheless. Ultramercial established that even novelty in the conception of abstract ideas will not save claims from Alice. It also provides a clear case of the power of Alice; the Federal Circuit had previously found the patent claims at issue valid on two separate occasions, and did not find them patent-ineligible until the Supreme Court handed down the Alice framework, indicating that the Alice test likely was the dispositive factor in the court's sudden about-face. The patents at issue in DDR Holdings concerned claims for generating a composite website from a host and a third-party merchant. The system allowed a user to click on an ad on the host website (such as Facebook), and instead of being redirected to the merchant's own website, the user is taken to a page that combines the look and feel of the host website and the product information from the merchant. This allows a user to essentially be in two places at one time, and prevents web traffic from being redirected away from the host's website while a user completes a transaction. In its § 101 analysis, the Federal Circuit held that the claims at issue did not merely recite the performance of a business practice known from the pre-internet world along with the requirement to perform it on the internet; they were necessarily rooted in computer technology in order to overcome a problem specifically arising in the realm of computer networks. This is a new and unconventional use of the internet, which normally would simply take someone who clicks on an ad to the ad owner's website. The court found that these claims had inventive steps beyond those of Alice and Ultramercial and were patent-eligible. DDR Holdings is noteworthy because it was the first post-Alice case to uphold a software patent against a § 101 challenge, since the court found that the claims at issue passed the test of the second part of the Alice test. Enfish, LLC sued Microsoft Corporation for infringement of two patents on “self-referential” databases. Enfish alleged that Microsoft’s “ado.net” product created and manipulated self-referential tables as part of its operation. Enfish filed suit against Microsoft in district court in California in 2012, alleging infringement. The district court determined on summary judgment that all the allegedly infringed claims were invalid under § 101, some claims were invalid as anticipated under § 102, and one claim was not infringed. The Federal Circuit reversed the grant of summary judgment in part, remanding to the district court after vacating the district court’s determinations under §§ 101 and 102. However, the Federal Circuit held that the claims were not directed at any method of storing data, but rather a specific method of doing so that achieves benefits over traditional databases (e.g. faster search times, increased flexibility, smaller memory requirements). Just as hardware can improve the functionality of a computer, so can software. In this case, the Federal Circuit found that the claims at issue were “directed to a specific improvement to the way computers operate, embodied in the self-referential table” and, therefore, were directed to patentable subject matter. Notably, this was the first decision since DDR Holdings to find a software patent valid in light of Alice. Even more importantly, this is the only case to hold that the software patent at issue was not directed toward unpatentable subject matter, meaning the court did not have to proceed past the first step of the Alice test. McRo, Inc. (Planet Blue) v. Activision Blizzard, et al. involved claims directed to a process for automatically animating the lip synchronization and facial expressions of 3D-animated characters. Starting with the first step of Alice, the District Court for the Central District of California found that the claims at issue were not directed to an abstract idea. Despite finding the claims failed the first prong of the Alice test, the court proceeded to the second step and found the claims failed on both prongs. This case proved noteworthy due to its unusual application of Alice, which ordinarily involves proceeding to the second step only if the court finds that the claims are directed to unpatentable subject matter in the first step. On appeal, the Federal Circuit reversed the district court, finding that the lower court had oversimplified the claims at issue. In its reasoning, the court stated that courts need to “look to both the claim as a whole and the individual claim elements” to determine whether they amount to significantly more than the abstract idea. The court also stated that whether at step one or step two of the Alice test the claims must be considered as “an ordered combination, without ignoring the requirements of the individual steps.” As a result, the court found that the claims at issue were non-abstract under the first prong of Alice, without having to address to the second prong. Intellectual Ventures owned three patents covering methods of screening email communications for viruses and spam. It sued Symantec, alleging that its anti-malware software infringed Intellectual Ventures’ patents. Symantec responded by moving for a judgment that all of Intellectual Ventures’ patents were unpatentable under § 101. At trial, the district court found that two of the three patents failed § 101’s patentability test, and Intellectual Ventures appealed to the Federal Circuit. The Federal Circuit found that all three of the patents at issue were directed to abstract ideas and were unpatentable. In an illustrative analysis, the court walked through the Alice test and found that Intellectual Ventures’ spam-filtering software patent was directed to an abstract idea because the software performed a “fundamental practice long prevalent.” The court compared the software’s function to the way people who receive paper mail look at the envelopes and discard certain letters from sources from whom they do not wish to receive mail. Intellectual Ventures’ patent merely implemented this basic practice on a general purpose computer, which was not a sufficiently “inventive” step to pass the second prong of the Alice test. A very notable aspect of the decision came in a concurrence by Judge Mayer, who applied a gloss on the Alice test that clarifies its central idea quite forcefully: “Claims directed to software implemented on a generic computer are categorically not eligible for a patent.” (emphasis added). Thus, at least one judge on the Federal Circuit believed that all software should be considered per se unpatentable. With this collection of guidance in mind, we will now turn to our examination of Alice’s effects on the USPTO in the three years since it was decided. 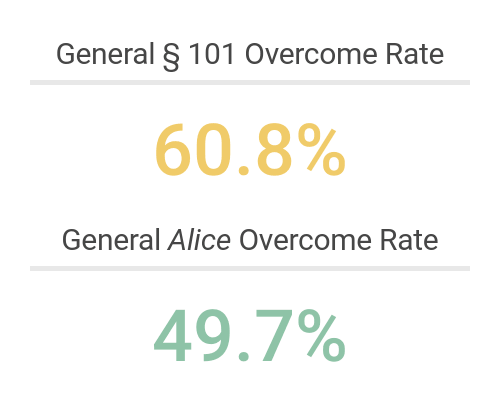 In May of 2016, we published a study of the effects of the Alice decision entitled Defeating Alice with Big Data. Juristat’s initial study looked at all Alice rejections, regardless of whether they were issued to applications filed before or after the Alice decision, and made several key findings regarding the initial effects of the decision. The majority of Alice rejections at the USPTO (66%, or two-thirds), were issued to applications in Technology Center (TC) 3600, which is the home of the e-commerce art units found in the 3620s, 3680s, and 3690s art unit groups. Inside TC 3600, about 40% of Alice rejections were issued in the 3620s, about 30% in the 3680s, and about 22% in the 3690s. The remaining 8% of Alice rejections were issued elsewhere in the technology center. Thus, about 92% of all Alice rejections in TC 3600 fell into the e-commerce art unit groups. Alice rejections made up a majority of all rejections issued in the e-commerce art units, at 74.5% in the 3620s, 72.2% in the 3680s, and 81.1% in the 3690s. Before the Alice decision, § 101 rejections made up 30.8% of all rejections issued in the e-commerce art units. Two years after the decision, in May 2016, § 101 rejections had jumped up to 81.7% of all rejections issued in the same art units. Our original study made it clear that, in just two years since the decision was issued, Alice had had a profound effect on a narrow, albeit important, technology sector at the USPTO. Looking at the raw number of Alice rejections that have been issued since the decision was handed down, the rejection count initially shot up quite dramatically in the second quarter of 2014 and peaked at 18,709 in the second quarter of 2015. However, the number of Alice rejections issued has been declining ever since that time. See Figure 2 for the raw number of Alice rejections issued since May of 2014. Although the raw number of Alice decisions issued at the USPTO has been in decline since the second quarter of 2015, Alice rejections as a percentage of § 101 rejections have continued to climb, reaching a high of 70.7% in the last quarter of 2016. In fact, since Alice was decided, the percentage of § 101 rejections citing Alice has generally increased every quarter since May of 2014. The increase in the percentage of Alice rejections was most dramatic between the second quarter of 2014 (when the case of decided) and the third quarter, rocketing from 11.6% to 48.3%, a 122.5% increase. This is to be expected, however, given that Alice was not decided until very late into the second quarter of 2014. See Figure 3 for the percentage of § 101 rejections that cite Alice since May of 2014. Because our initial study of the effects of Alice was published only two years after the decision, that study examined Alice rejections that were issued on applications that had been filed both before and after the decision. For our 2017 study, we limited our data only to applications that have been filed since the Alice decision. Our reasoning for this is two-fold. First, it allows us to more clearly illustrate what post-Alice patent practice looks like at the USPTO, and, second, it gives us a more accurate picture of the effects of the decision, since all of the applications in our sample are free of any pre-Alice prosecution history that could affect their outcomes. Thus, all of the data going forward derives from applications that were filed after Alice was decided. For applications filed after Alice, we found that the top art unit groups for applications that cite Alice rejections continue to be the e-commerce art units in the 3620s, 3680s, and 3690s. After those three art unit groups, this rate drops quite significantly for the remainder of the top 10 art unit groups with the greater percentage of applications that contain Alice rejections. See Figure 4 for a listing of the 10 art unit groups with the greatest percentage of applications with Alice rejections. A similar picture emerges when looking at the percentage of applications containing Alice rejections by class. The class with the greatest percentage of applications with Alice rejections is class 705, which handles “data processing: financial, business practice, management, or cost/price determination” applications. After class 705, the rate at which applications contain Alice rejections drops significantly. See Figure 5 for a listing of the 10 classes with the greatest percentage of applications with Alice rejections. This data indicates that the effects of Alice, while profound, are also extremely localized. As illustrated above, if an applicant receives a § 101 rejection, there is a 63.9% chance that that rejection will cite Alice. Overall, applicants who receive § 101 rejections have a 60.8% chance of overcoming them. * However, if the rejection cites Alice, that chance drops to 49.7%. Of course, these statistics are mere averages. To understand the outlook for applicants on a deeper level, we will need to examine how most applicants handle Alice rejections and how successful their strategies are. When it is time to respond to an Alice rejection, the vast majority of applicants choose a request for continued examination (RCE), at 65.1%. ** The second most frequent response is abandonment, at 18.4%. It is hardly surprising that almost a fifth of applicants who receive an Alice rejection abandon, given Alice’s reputation as an application-killer. See Figure 6 for the frequency at which applicants choose the various methods of responding to an Alice rejection. Juristat offers big data analytics tools to patent prosecutors to help them overcome some of the thorniest dilemmas they face in their day-to-day practices, including getting around Alice rejections. Using data, patent attorneys can gain a clearer understanding about exactly how their examiner interprets the Alice decision, giving them the opportunity to tailor their arguments in response to an Alice rejection. Additionally, data allows patent attorneys to predict their examiner’s next move, preventing the wasting of time and resources on logically ineffective prosecution strategies. Finally, data allows practitioners to discover their strengths and market them to clients who face long odds of obtaining software patents in an increasingly competitive legal market. The best way to get around an Alice rejection is not to get one in the first place, and that strategy begins with the way you write your claims. In most cases, a few simple words in your claims like “computer,” “data,” or “shopping cart” can cause the USPTO to assign your application to a class and an art unit where it is almost guaranteed to receive an Alice rejection. However, when you use Juristat Drafting, you can avoid that. Juristat Drafting allows you to input your claim language and find out the probability that your application will receive an Alice rejection based on the class or art unit it is most likely to be assigned. It also tells you which words in your claims are most responsible for that classification. You can then use this information to tweak the language in your claims to reduce your chances of assignment to an Alice-heavy class. It is no secret among patent attorneys that it is difficult to obtain software and business methods patents. However, the reason for this may not always be so clear to clients, and their patience in dealing with (and financing) a complex prosecution is not without limits. They may not understand exactly why their application keeps getting rejected, and if they are going to blame anyone for this, it will most likely be you, their attorney. If your client’s application lands anywhere in the 3620s, 3680s, or 3690s, it is safe to say that prosecution is going to be a long, uphill battle and you should share this information with your clients up front. This will allow you to explain the unique challenges that prosecution in this technology sector requires and reduce the risk that your client will blame you for an unfavorable outcome. *Juristat considers a rejection to be “overcome” if the next office action is either a notice of allowance or another rejection that does not cite the same rejection basis as the previous office action. For example, assume that an applicant receives a final rejection that cites §§ 101 and 103, she responds with an RCE, and the next rejection only cites § 103. We assume that the RCE was successful at overcoming the §101 rejection, since it was not raised again in the subsequent rejection. **Because almost all successful responses to final rejections also include a subsequent amendment, we did not consider an amendment to be a distinct response to a final rejection, and thus we calculated how applicants responded whether or not that response included an amendment. For applications in which there were multiple responses (i.e., an RCE and an interview), we did not determine the chronological order of those responses, but rather, only that each response was made to the rejection at some point prior to a subsequent rejection or an allowance. ***Rejection response success rates were calculated based on applications in which the highlighted response was the only response to the rejection in question.